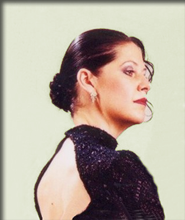 Christy Coté has been teaching, performing and choreographing Argentine Tango since 1996 and is one of the most respected teachers of Argentine Tango in the United States today. Her teaching method has been published in the Argentine Tango manuals by Dance Vision which are complimented by a series of 21 instructional videos with partner, George Garcia.Christy’s popular Tango Boot Camps have attracted thousands of students since 2007. She is also one of the featured teachers and performers for CITA, the annual International Tango Congress in Buenos Aires. In 2012 she became the first ever American judge for the Official USA Tango Championships, an annual event sanctioned by the Argentine Government. Christy has been featured on San Francisco’s KTVU Segment 2 Report, KPIX/Channel 5 Evening Magazine, nationally in Dance Spirit Magazine as well as numerous San Francisco/ Bay Area publications. Christy is one of the founding members and choreographers of the all female tango company, Tango Con*Fusion created in 2004. Performance credits with the company include Leading Ladies of Tango at San Francisco’s Herbst Theater in 2007, Polly’s Ferman’s Glamour Tango in Chicago 2009, tour with Latin Grammy nominated band Tanghetto in 2011, numerous CITA (International Tango Congress) shows, Lady’s Tango shows with Johana Copes & Queer Tango Festivals in Buenos Aires. Christy’s choreographic credits include Los Diablos Ganchos cruise ship show, Teatro ZinZanni’s Love, Chaos, and Dinner with Joan Baez, and Tango del Cielo featuring harpist Anna Maria Mendieta. Christy has also coached Cheryl Burke (of Dancing with the Stars fame) for her performance in iconic show Forever Tango, as well as the Smuin Ballet dancers for their production of Tango Palace. Christy’s performance credits include NCL’s Tango at Sea Cruises, TANGO X 3 at San Francisco’s Palace of Fine Arts, The Elegant Era, The Latin Show at the San Jose Center for the Performing Arts, The 28th Annual San Francisco Ethnic Dance Festival in 1997 & 2007, 49er’s Half Time Show, La Notte Canta with Pasquale Esposito at Guglielmo Winery, Tanghetto show at ND Ateneo Theatre, Buenos Aires, U.S. tours with Orquesta Victoria of Buenos Aires & MonTango and ongoing dinner shows since 2001 at Pena PachaMama Restaurant in San Francisco’s North Beach. Christy has partnered with United States based partners George Garcia, Darren Lees, Chelsea Eng, Debbie Goodwin, Count Glover, Daniel Peters, Eugene Theron and with internationally acclaimed dancers from Buenos Aires including Eduardo Saucedo, Facundo Posadas,, Daniel Lapadula, Marcos Questas and Pampa Cortes. Christy is based in San Francisco where she teaches weekly classes at La Pista and Boot Camps at various locations around the Bay Area. Like Christy’s Facebook page or follow her on Twitter and Instagram.